Welcome to the Macoun Field Club! We’re now approaching spring. Families can enquire about having their children join at any time. Either phone Rob Lee at (613) 623-8123 (note that “Macoun” rhymes with “crown,” not “croon”), or e-mail him at Macoun@ofnc.ca. The Macoun Club is sponsored and supported by the Ottawa Field-Naturalists’ Club (OFNC); there are no fees. 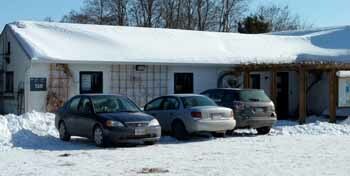 Indoor meetings take place at the Fletcher Wildlife Garden building beside the Experimental Farm’s arboretum (Building no. 138). Meetings start at 10 a.m. and wrap up between 11:30 a.m. and noon. Field trips take place on alternate Saturdays and typically run about 5 hours (sometimes with the option to attend only the part before or after noon). We go to wild places in Ottawa’s western Greenbelt (Stony Swamp) and Lanark County (the Pakenham Hills). What are meetings and field trips like? Here’s what we’ve done so far this year. March 30, 2019: Another field trip cancelled, owing to bad weather! Every time we breathe in, we are bringing a packet of atmospheric gases into our lungs, and when we breathe out, some of the oxygen stays behind, to be carried through the bloodstream to every cell in our bodies. And more than this: at every breath there is an exchange of gases, as we take in oxygen and release carbon dioxide. The atmosphere is a part of us – and we take part in shaping its composition. It has always been like this, since life began on this planet. Macoun Club member Carter Brooking traced out for us the ups and downs in this process through a billion years of geological time. We’re all becoming familiar with the way that carbon dioxide concentrations can change, but did you realize that whole geological periods and eras that are familiar names to us, such as the Jurassic or the Ordovician, corresponded to stages of atmospheric evolution that differed greatly in oxygen content? And that living things were often the cause? This is what Carter brought home to us today. Some turtle populations in Ontario are in trouble because Raccoons dig up and eat their eggs, and at any time of life, cars run over and crush them. How would you protect a turtle nest from predation, while also allowing the hatchlings to emerge into the environment? And have you ever helped a turtle cross the road? You may have saved its life. But what if it had deliberately come to the road as a place to lay eggs? If you are serious about helping turtles survive human civilization, you need a better plan. David Seburn, an old friend of the Macoun Club, came in today to tell us what it takes. Dave has developed a new program for the Canadian Wildlife Federation in which he and a small team search for Snapping and Blanding’s Turtles in the act of laying eggs. That very day they dig up the eggs before the Raccoons come out, and hatch them in incubators. It takes a couple of months. When the whole clutch has hatched, they return them to the site where the eggs were laid, and release the little ones to swim away. Instead of 90% mortality, they’re getting 90% survival, at least in the first critical stage of life. February 23, 2019: What are these things? The Macoun Club has taken on the task of preparing a challenging nature quiz for the adult group at their annual Awards Night event. Today we brought together a number of objects and selected a reasonable number for presentation: a bird nest, and some vibrantly coloured feathers from an unrelated species; a fossil; a scrap of reddish brown lichen; a deceased insect; and an assemblage of local tree parts (mostly winter twigs). All these were laid out for inspection at the evening event, and after everyone had had a chance to get a close look, Macoun Leader Jen Line held each specimen up for identification and comment. For the first time, some of our objects came from exotic places. Someone recognized the nest as that of an Oriole, but not that the material was palm fiber woven by a Hooded Oriole. The big feathers were from a Macaw; and the fossil a petrified walnut from California. Ernie Brodo was delighted to see a specimen of the Arctic Tumbleweed Lichen, Masonhalea richardsonii, from the Yukon. The insect was an adult Cicada. And one set of stem-like plant parts, although obtained locally, were from an import from China: the now empty fruit-bearing stalks from a Ginkgo tree. February 16, 2019: Snowshoes were essential! Snow, deep and soft, is the hallmark of this winter in Ottawa, and to get around in it everyone needed snowshoes today. We beat our own trail through the forests, crossed ash and cedar swamps, and halted for lunch on a sunny knoll. By then we all knew that high-tech footgear with crampons, which is fine for icy crusts, literally let us down, and that only big traditional snowshoes would let us walk on top. The Deer, of course, punch through at every step, and evidently move about in pathways they have established. We saw several half-moon shaped deer beds, sunk deep in the snow. We had to cross about half of our square-mile Study Area before we actually saw much wildlife, but once we got into “Porcupine Alley,” we were well rewarded for our efforts. We also saw the tracks of a Fisher, and elsewhere, a Snowshoe Hare. But a tiny snow-crawling insect with long, gangly legs attracted just as much interest. It was an adult, but had no wings. It was a winter Crane Fly, Chionea valga. We haven’t seen one since the Feb. 27, 2016 field trip. There is a widespread misperception that plants aren’t interesting; they don’t move or make sounds on their own, and around Ottawa the dominant ones (trees) stand bare and dormant for half of each year. Former Macoun member (and now leader) Jen Line overcame all that apathy and soon had the whole Club in her train. There was so much she wanted to convey: What are plants? (And what are not? ); How are they important (Macouners had many answers, ranging from “food” and “the basis of nearly all ecosystems” to “I climb trees); and, How do we tell one from another? Once she narrowed her scope down to angiosperms, which produce flowers and fruit (as distinct from mosses, which lack vascular tissue; ferns, which produce spores; and conifers, which produce seeds in cones) she turned what is all-too-often a dry lecture on the parts of a flower into a hands-on sculpting workshop. Each member was given some coloured play-dough and asked to mold it into any one of a limited set of patterns for sepals, petals, stamens and pistils. Then she took the appropriate shapes and assembled model flowers representing five major plant families in the Ottawa area. The central concept she laid down was that these things are always found in the same order in every flower, from bottom to top, no matter how bizarre they look, and that knowing this, you can figure anything out. We cancelled only the group outing; those of us living west of Ottawa were still able to drive and some of us proceeded with our own private field trips where we could. The snow still came down heavily, and lay so deep underfoot that we needed snowshoes, but it was good to be out and we wished everybody could have been. We’ve all heard news stories about elephant poaching, and how rhinoceroses are being driven to extinction solely because of a popular demand for rhino horn as “medicine.” Just last week the media reported that a man who was caught smuggling live falcon eggs through Britain to the Middle East (for falconry) has been sentenced to three years in prison. Today Sheldon Jordan told us that dealing with this man’s plunder of Gyrfalcon nests in northern Quebec nearly 20 years ago was his first case. Now Mr. Jordan is Director General of Canada’s Wildlife Enforcement Directorate. He laid out before us a diverse display of objects confiscated by enforcement officers, and talked about the issues involved with many of them. He said that Canada is the second largest market for illegal shark fins outside of Asia — a subject we have heard about from former Macoun Club members who study sharks. He also mentioned that his people enforce the Species at Risk act here in Canada, protecting Bank Swallow colonies and Western Chorus Frog habitat from destruction (or prosecuting when a person or company has been caught). The term “wildlife” nowadays covers more than just vertebrates. Leeches are covered, too, and there’s a current enforcement case underway. And in terms of commercial value, much more plant material than animal is being moved around the world. Mr. Jordan said that 30% of the world’s paper has probably come from trees cut illegally. No wonder deforestation is such a problem for wildlife conservation. January 19, 2019: More botany than birds at -20º C! Macoun Club leader Annie Bélair hosted a field trip today, a sort of prototype for trips to Macouners’ homes and natural environs. She welcomed arrivals with a campfire in her backyard, and before they could get away, the professional botanists in the group enthused over the “cool” plants growing there – little crooked sticks and wisps of dried-up things, such as the shrubs Sweetfern (Comptonia peregrina) and New Jersey Tea. This latter plant (Ceanothus americanus) is what the caterpillar of the Mottled Duskywing eats — and owing to the scarcity of its food plant, that butterfly is on Canada’s Endangered list. Annie then led the kids and adults downwind into the marsh at the head of Buckham’s Bay, then doubled back through the Red Oak and Large-toothed Aspen woods leading back to her house. There had been Coyote tracks out on the ice, and there were Deer tracks in the forest. After lunch at the fire, there was another little foray into the woods, with discussion about how to distinguish Downy from Hairy Woodpeckers. Macoun member Gabriel McMurren has a special appreciation for New Zealand, and after visiting family there, he returned with a personal connection to many of that country’s birds. He showed us pictures of those that he himself saw, such as the Kereru, a pigeon so large that its wings swish noisily as it flies, and the tiny New Zealand Fantail, which he characterized as friendly and cute, a “fly-in-your-face” kind of bird. Too many species, he told us, are rare or even critically endangered because of the island nation’s history of habitat destruction and its burden of introduced mammalian predators. In the last couple of years, biologists have succeeded in getting rid of rats and mice from two small islands, and in 2016 an incredibly ambitious plan was announced to eliminate invasive rats, weasels, and possums from the whole country by 2050. Some of our Study Area animals are most easily seen or found when the ground is covered in snow. Today the temperature went above freezing by a few degrees, and that brought out so many midges that they formed dancing courtship swarms in the lower parts of the forest. The one that alighted on an outstretched finger appeared to be the same as the one pictured on Nov. 17th, below. The melting snow also brought great numbers of snow fleas (Collembola, also known as springtails) up from the leaf litter to the surface. They congregated on tree trunks. Squirrels had been digging down through the snow to their caches of acorns; one had brought up eight hickory nuts, but left them beside the hole, as they had gone mouldy. Tracking conditions were poor for larger creatures, but we were able to follow Porcupine tracks over little hills, through a hollow log, and past a tall White Pine where the animal had been feeding (littering the snow with cut twigs, the bunches of needles raggedly bitten off). In the end, that particular Porcupine eluded us, but we later did see a big one high up in a White Spruce, and when we checked a favourite culvert, we found it occupied by a small Porcupine. Many of us noticed more Monarchs drifting southwest last September than we have in recent years. They were heading for their famous wintering grounds in Mexico. How do we know that? Because people like our speaker Genevieve Leroux have been placing tags on their wings, and when they’re recaptured the information fills in the map. Genevieve has tagged over 120 Monarch butterflies, and advanced conservation efforts in the different places she has lived. Next, Rob Lee brought in a box of Trilobite specimens (donated by former member William Godsoe) to give away, and he used the occasion to talk about what makes these extinct creatures unique in the history of life on earth: trilobite eyes used crystals of the mineral calcite to refine their pixelated vision. Almost all the specimens Rob brought in were the tail sections of a single species, Pseudogygites latimarginatus, that had been shed in moulting. Upon studying the piece of Billings shale she chose, Genevieve found an overlooked head section. There were also two small Triarthrus sp. cranidia. Winter is proceeding in fits and starts, and although the snow that fell two weeks ago hasn’t quite melted away, it is getting thin. We saw several flying insects and spiders on or over the snow. Having penetrated far enough into the Pakenham Hills to feel we were in a really wild place, we left the familiar trails and disappeared into the snowy forest and set about making a central lunch fire. It was more difficult than we expected because even the best firewood was damp after so many damp days – snow clinging to the branches had melted and soaked in. How would Macoun members respond? They spread out and made their own fires, and cooked or warmed our meals. Afterward, we walked over to Gerry’s cabin; while the many adults (parents and leaders) engaged Gerry in conversation about wildlife, the kids explored the streambanks. Looking up, he explained that a passing eagle was just checking for animal carcasses toward the end of hunting season, and the beginning of fur trapping. Seven of eight hunters had got their deer; he offered us a spare set of first-year antlers. What would you expect to see if you travelled around Indonesia? Komodo Dragons? Check. Coral reefs? Check. Tropical birds, such as Drongas? Yes again. Roving naturalist Roy John has been there, and showed us his photographs of all these and many more amazing creatures. He snorkeled on the reefs, and had photos of beds of corals and crinoids, and pictures that illustrated the diversity of tropical seas. He had swum with sea snakes and sharks, sea turtles and sea slugs, and seen Pygmy Sperm Whales and “Spinner” Dolphins. Eco-tour guides also took him close to shores where Komodo Dragons stalked the sands; one of these gigantic monitor lizards took affront and, huffing and hissing, charged into the water at them. “I didn’t know they could swim!”admitted one startled Macoun Club member. The day after the season’s first good snowstorm, we trudged into our Study Area from the northeast (Forestview Crescent). Any hopes we had of seeing fresh animal track that had been made overnight were erased by flurries that continued into late morning. But people had been there before us and quickly rolled up a big ball of snow. It was still there; we made it much bigger. We passed through three Red Pine plantations dating from the 1960s and the beginning of the 1970s, and were impressed at the dense, even-aged growth of invasive Glossy Buckthorn that will soon close off these areas to easy passage. The only sign of animal life was where a Red Squirrel had cached Red Pine cones under logs, and retrieved a few to dismantle for their edible seeds. Although Porcupines will readily feed on Red Pine bark, they cannot normally live in the plantations because there are no big, hollow trees for them to den in. But we found these animals close by, two in towering Eastern White Pines and one in an Eastern White Cedar. A passing insect alighted on the snow briefly; the temperature was hovering around the freezing point. For 70 years, people have been donating their collections of natural objects to the Macoun Club, and today, after an introduction by Morgan, we opened six boxes of seashells and seashore life that have been sealed up for a dozen years. Inside were hundreds and hundreds of mollusk shells – univalves and bivalves of varied sizes – and a few dried starfishes, corals, and a seahorse. We got out a microscope for closer examination. We recognized oysters and cowries and scallops; other shells we looked up in our field guides. A very few specimens had been labeled by the collectors, such as one with a note that was dated 1955 and signed E.L.B (for the late Ed L. Bousefield, a Macoun Club leader in the early 1950s.). Some had been numbered at one time, but no catalogue has come down to us. We had a fun time, but without information on who the collector was, and where and when the specimen was acquired, we couldn’t do much more than admire the forms and colours, and learn about them in a general way. What would we see in the cold, wet woods, with rain still falling, and winter just around the corner? For a long time all we saw was trees — Sugar Maple, Butternut, Bitternut (Hickory), Ironwood — and we named them all. Eventually, rolling logs, we saw tiny millipedes (family Julidae) and introduced earthworms (Lumbricus rubellus). No ants or salamanders, but something one can see only at this time of year — a large wasp, an overwintering queen, concealed in a hibernating cell she’d cut into the compressed debris under the log. At long intervals we glimpsed the small birds of late autumn or winter moving about — a few Black-capped Chickadees, a Downy Woodpecker and White-breasted Nuthatch, and a Brown Creeper. Blue Jays started calling. Mostly the woods were quiet, with just the steady patter of rain on the yellow leaf litter of the forest. All day, Rob kept scanning the treetops — the oaks and the spruces — for Porcupines, and finally, minutes before leading the group out of the woods, he spotted one. It was a very small Porcupine, just born this year. The freshly exposed, light orange inner bark of a nearby Red Oak showed what it had been feeding on, but it had moved from the big tree to a little sapling, and had nowhere to go while we crowded around. After seeing the early departures off, the small group remaining went back for another look at this little animal, and nearby happened on two White-tailed Deer that were feeding on the last soft green vegetation to be found. Their demeanour seemed unconcerned, but their ears kept swivelling back and forth between us and passersby on a nearby trail. Finally, several dogs put them to flight. Once or twice a year Macoun Club members bring in a selection of nature photographs they have taken themselves and have the images projected on a screen for all present to appreciate. Some are fine pictures, well composed and focused; others represent well the fleeting glimpse that so often is all we get in the wild. Julia had travelled, and showed us a Formosan Rock Monkey, endemic in Taiwan, at home in a forest there. She’d also given her attention to exotic insects – a blue-and-red dragonfly that she knew to species, and some kind of hairstreak butterfly. She had also gone to Point Pelee in southern Ontario in hopes of seeing great numbers of migrating Monarch butterflies – but found she’d just missed the spectacle. She did get pictures of some migrating raptors: an immature Bald Eagle and a small accipiter. Jan filled our screen with pictures of European birds he’d seen in Poland: Greylag Geese, Mute and Whooper Swans, Avocets and a Curlew. It turns out that Niccolo, who is forever turning logs and finding salamanders, has also been raising butterflies from caterpillars, and had photos of Black Swallowtails and Monarchs, documenting the stages of pupation. In the Pakenham Hills, the leaves of the forest were mostly down and birds were few, but we found three different species of salamander under rotting logs: Eastern Newt, Blue-spotted, and Red-backed (the lead-backed form). Rob found an introduced earthworm, too. In a wooded hollow, we disturbed two Great Blue Herons that seemed to be hunting for frogs in a wet, sedgey place. We made a lunch fire on a rocky island on a bend in Indian Creek, with the water flowing by on either side. We were out of the cold north wind, and in full sunshine when the clouds parted. A sudden urgent croaking made us look up as a Raven powered overhead, hard on the heels of a large accipter. But they swept by so quickly that we could not agree on what species of hawk. We had a better chance to examine a late autumn dragonfly too much chilled to flee. “A Saffron-winged Meadowhawk,” suggested Gabriel. “It isn’t black,” he said, ruling out one species, “and doesn’t have yellow legs or black triangles on the abdomen,” eliminating two more. “But that’s just a wild guess,” he modestly concluded. Oct. 13, 2018: Can Chimney Swifts do without chimneys? Our speaker, Melanie Farquhar, came in with lots of questions for us, all relating to Chimney Swifts. There must have been a time, only a few hundred years ago, when there were not yet any chimneys, but this species has so completely switched over that natural roosting and nesting behaviour is rarely observed. Now their population has fallen 99% since the 1970s, and people wonder if the disappearance of masonry chimneys is to blame. Would they use artificial chimneys that we build for them? Melanie’s field research examined this issue, and she said that the birds use such structures in Texas, but not here at the northern edge of the Swift’s range. Swifts are aerial insectivores, and other flying insect-eaters have declined, too. Chimney Swifts winter in South America, and it may be that habitat loss in the upper Amazon Basin is a factor, too. Sept. 29, 2018: Did you worry about your Study Tree? We returned to our study area, focusing attention on our Study Tree Woods. Powerful gusts of wind had torn a gash through the forest, knocking over a dozen big Sugar Maples in a row. It was disorienting at first, because the trees are our landmarks. As far as Rob could tell, no current member’s Study Tree was uprooted, and only one that was chosen back in 1992 (the “Sway-based Maple”) was badly damaged — it lost half its crown. These are among our oldest trees, about 150 years. Continuing our apple project, begun April 21st this year and resumed on Sept. 15th (see below), we headed to a familiar abandoned orchard. The trees are arranged in rows, but seem to be wild nonetheless: their trunks are multiple and the fruit is small and sour. Among the apple trees, Niccolo and Garrett found a small Milk Snake, a seldom-seen resident of our Study Area. We had scheduled a members’ photo day, but there was no power in the Fletcher building — or for hundreds of thousands of Ottawa residents. Yesterday afternoon, very strong winds knocked out electrical substations and downed hydro poles; tornadoes tore through Dunrobin and parts of Gatineau. Not all members could make it to the meeting. We shared observations, examined a regional topographic map, and held elections, before finishing up with a brief exploration of the crabapple plantings on the adjacent Arboretum. Historically, the Macoun Club’s square-mile nature-study area outside Ottawa was occupied by five or six farming families. The people and their buildings are long gone, but the old homesteads are still discernible by some of the non-native food plants, garden flowers, and fruit trees that have persisted for 60 or more years: Rhubarb, Lily-of-the-Valley – and Apple trees. We could find only the wild descendants of orchard trees, with fruit that tended to be small (< 6 cm), hard (which preserves them from pests), and usually sour (an acquired taste). We sampled apples from half-a-dozen trees. Some were very attractive, with a red blush or red striping, but the only sweet one was a light green colour. Along the way, we found many Green and Leopard Frogs, a couple of Garter Snakes, and (in a marsh) a Water Snake. After lunch, sounds like a toy horn drew us to a Bitternut Hickory with two large Porcupines high up in the crown; the ground below was dotted with hickory nuts. And in the midst of the wave of Ash tree death sweeping our Study Area (because of Emerald Ash Borer) we saw several tiny insects moving in and out around a Red Ash tree. They appear to be a native parasitoid (genus Atanycolus). By way of getting to know each other, we asked each member, new and old, what they were most curious about and would like to learn more about this year. The answers ranged from trilobites to otters. We aim to pursue some of these subjects in the course of the year. Rob brought out a box of bones and said it had been donated with no more identification than “Tortue sp.” (some kind of turtle). Only one member was interested in having the bits and pieces until Rob revealed that the note also included the location, right down to latitude and longitude, as well as the names of lakes and rivers where the specimens were found. Equally important, this label gave the name of the collector and the date. Rob said that with these three pieces of data — place, date, and collector’s name — this specimen would be acceptable in any museum of natural history. Now another boy wanted it. As for the species, that will have to be worked out by comparison with other specimens in a reference collection. We had a Snapping Turtle skeleton right at hand, and ruled that one out, at least.